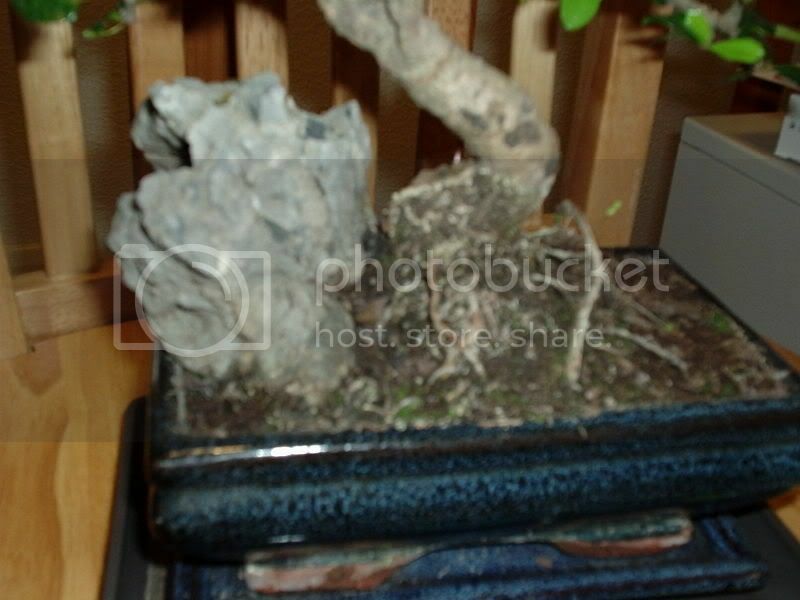 I bought a new Bonsai (Fukien Tea) a month ago and it seems to be doing quite well, can see new growth and its drinking a lot. I was advised that it looks to be in the wrong soil and I'd like some advice on the best way of changing it. Firstly, is this the right time to do it? Should I leave it as at the moment whilst it seems to be quity happy? Also when is the best season to do this for this species? I live in England and its wintry at the moment. The tree seems to have been in this pot for quite some time as its sunk into the soil quite well, I would probably estimate it being in the same pot for about 2 years. Also the tree has a large rock and that seems to be sunk in just as well. I have read the advice about how to repot, chopping back finer roots and putting it into a larger pot. I am a little worried about the roots in case I kill it, the last 2 trees that I did this with both died a month or two later. As its a soil change, do I need to change the free soil that the tree is in or do I have to totally replace the soil including the surface of it? Do I need to disturb the root mass at all? Glad to hear that this tree is doing well. What ever happened to the other one? And did you ever get the supplemental lighting? As I have noted before I don't grow this species but the links that you were provided by myself and Sharp, I believe, indicate that spring is the best time to do this work. One source says early spring, the other as growth begins. Not really sure where this came from but I can't really agree. Larger roots are reduced leaving finer roots to do the lions share of the work of absorbing water and nutrients. Aftercare is crucial as well. A newly re-potted tree is much more vulnerable than an established one. One of the links I provided before mentions the possibility that it may still be in heavy soil from the growing field (underneath what you can now see) and if so must be replaced gradually. In general it is better to have a homogeneous soil that is the same throughout. A pot with two different soils will have two different zones that will behave differently. One area either too wet or too dry. I did get the superficial light, a flourescent one and that does seem to be helping the new one, its growing towards it quickly. Thank you for clearing up the uncertainty I had with the roots, Ive always been a bit unsure about it. I'm going to wait until the Spring comes along and try gradually changing the soil. I'll bear in mind what you said about two different soils, I never thought about that. Thanks for your reply. I thought my tree looked a bit tight in the pot as well, so I'll be repotting it in the spring. 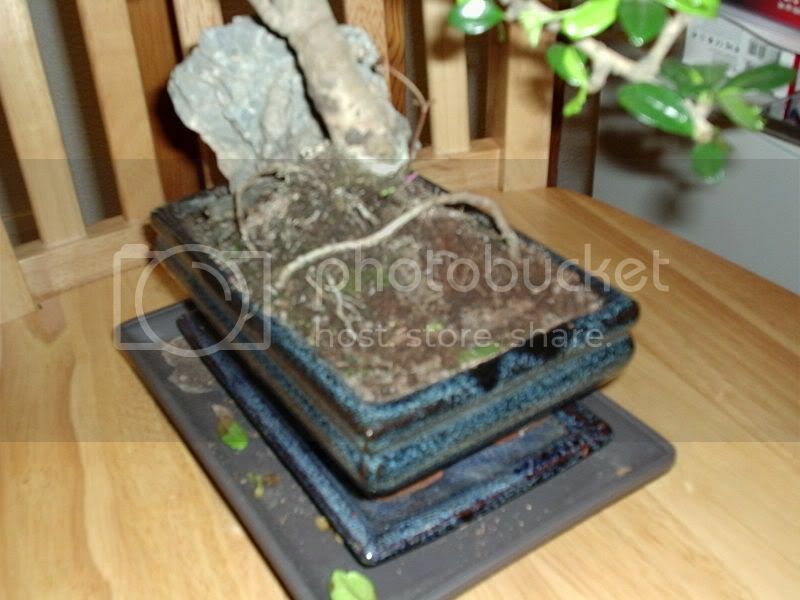 This is my second Fukien Tea, so hope that my advice helps! Make sure it never dries out totally, try sliding in a cocktail stick to see how damp it is, if you pull it out and it brings out soil then its wet enough, if it doesn't bring any out, it probably needs watering. Don't let the soil become totally soaked unless its dried out completely. Just water it enough until a tiny amount of water comes out of the bottom of the pot (with me I let a couple of drops drain out). So you know that the water has not run down the inside of the the pot pick it up and if its heavier then its ok. I tend to water mine on average every 3 to 4 days. With regards to feeding, once every 2 weeks in the summer, once a month in the winter. Make sure the feed is diluted down, don't just put it on neat like I did with my first one! As far as pruning is concerned, its something I'm still quite new to, at the moment I'm just letting mine keep shooting new growth and then when I think the shoots are getting too long prune them back so it looks sensible. The only other bit of advice I can offer is to keep it away from draughts or the cold, as I've learned, they don't like any sort of draughts. Thank you very much for the advice . It's going to help me a lot with my Tea. Fill us in about yours when you repot it. I hope it does well. A. Drying out completely is out of the question. B. A complete saturation of the soil IS the goal every time you water. There is no point in watering only part of the soil when the tree is going to be utilizing all of it for moisture/nutrients etc..
IMO this statement is akin to saying 'Don't eat until you are full unless you are starving.' Know what I mean? Just water it enough until a tiny amount of water comes out of the bottom of the pot (with me I let a couple of drops drain out). IMO this is not enough water. Water until the water FLOWS from the drainage holes. Wet is wet. So you know that the water has not run down the inside of the the pot pick it up and if its heavier then its ok. If any of the water is retained in the soil at all the pot will be heavier.... Hefting the pot can be an effective way of judging the moisture content of the soil but it takes a while to get a feel for it and you must be aware of what the weight feels like when both heavy/wet and [nearly] dry. Last edited by ynot on Tue Jan 23, 2007 3:43 pm, edited 1 time in total. Thanks for clarifying those points on watering. You are, of course, correct. Welcome back, its good to have you here. It is nice to be seen.